Today's post features the only wine that I'm allowed to enjoy this month and is all about how to keep warm yet stylish in this freezing cold weather. We've had no snow yet in Belfast thankfully but it may hit before the weekend…cue excited kids! 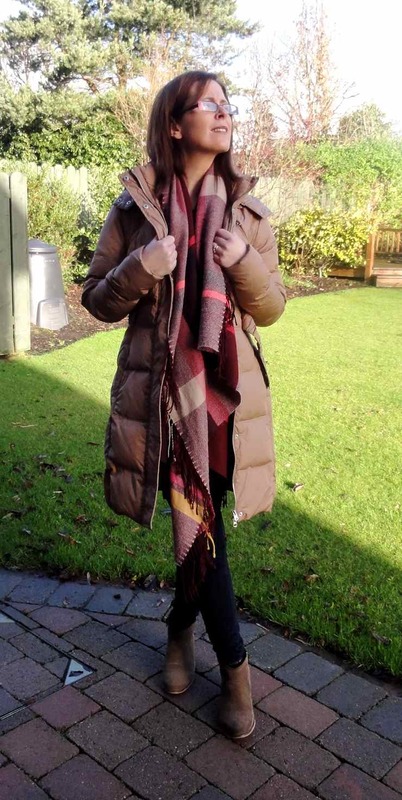 Today's outfit was inspired by the gorgeous, cosy and huge shawl style scarf from H&M that the Victoria Square Personal Stylist, Rebecca McKinney chose for me when I was with her in September. 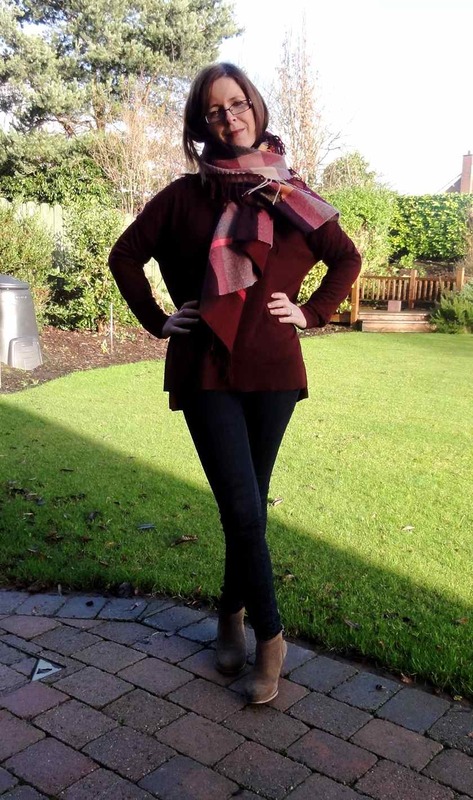 I wore it with an oversized burgundy jumper, also from H&M, navy skinny jeans from Gok @ TU for Sainsburys and my Mango suede ankle boots. Next up, the warmth factor. Underneath my skinny jeans, I'm wearing Primark's wonderful thermal tights. These are fab…fleece lined and very warm. Then, underneath my jumper, I'm wearing my M&S cream thermal long sleeved top. Oh and I've got thermal socks on too - have I ever mentioned how much I feel the cold? Finally, for heading out on the school run, there is nothing that keeps you warm like a proper down coat. My Merrell is warm too but when it's dry, I always wear one of my Vila Down coats from Room 31 - today it's the turn of the Camel coloured one, last seen here (black one last seen here). Unfortunately, they are sold out in R31 now. So tell me how you've been keeping warm this week? All hints and tips are welcomed! LOOVE that outfit, i would wear similiar in coloring AND thermals! planning on stealing it sometime soon. I'm always cold too, maybe it's a NI thing!!! I've been looking for those thermal tights in all the primark's and can never find them, did u get them recently? I'm with Joanna!! Don't think I could do a month without wine!! Lovely outfit but I think I would expire from the heat if I wore thermals as well!! How will you survive if the snow does come?? The fleece tights are seriously good for keeping warm. I love them. I haven't bought any this year so I don't know if they're stocking this year but if you can get them - get them. 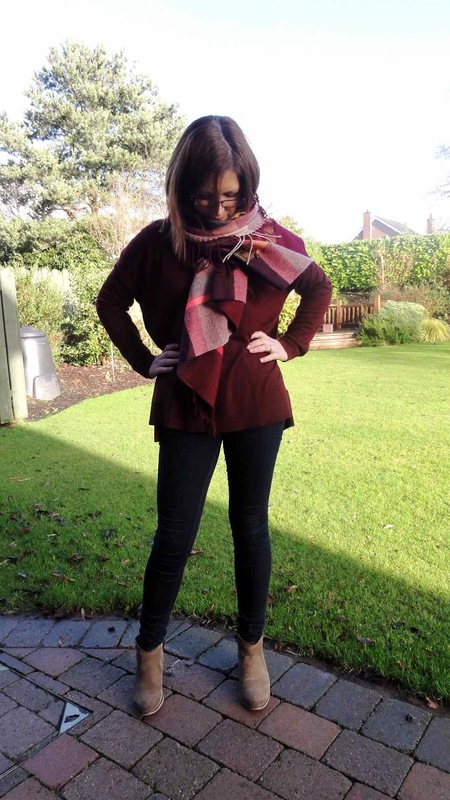 I haven't worn many skirts or dresses so had no real need for them but I have used them for layering under things too as they're like the perfect thermals. Great look Avril, love the coat and boots. 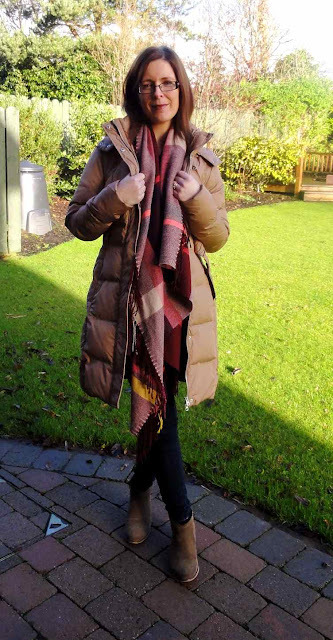 I've been wearing my old black John Lewis puffa, couldn't live without it! I am still debating whether to buy a new puffa or not in the sales ... I love your camel one! I normally feel the cold really badly, so I bought an M&S thermal long sleeved top back in November, but I don't know if it's because I am pregnant or what, but I can't wear it, I get sooo hot in it and flustered! Lots of thin thermal layers from Marks and Spencer! Great outfit and great colours. We are scarf twins ! Brought the scarf thanks to you, it's really warm more like a shawl or a rug. You look lovely in the wine colour. Warm Winter Boots & Merrell Bargains! Mink & Black Crampon Style! It's your last chance to win a handbag! Navy Dress & My Mixed Up Scarf!